If you have an old rocking chair lying around or can to buy it on a garage sale then you can give such chair a new life. 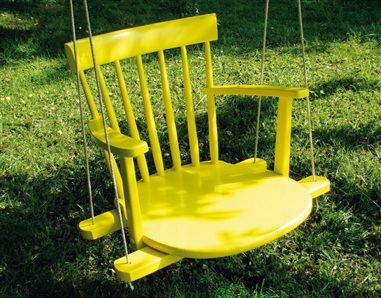 You can turn it into a cool and stylish kids swing for your garden. Of course you should have a quite high tree there to hang the swing on it. Not only your kids will be happy but such swing will also add a touch of style to your backyard. 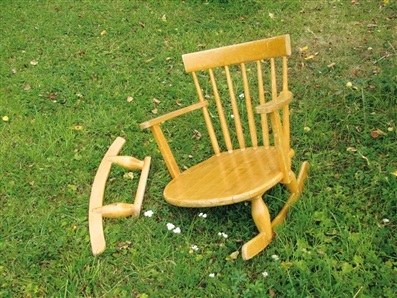 Here are things you’ll need for such project: a strongly built rocking chair with arms, heavy ropes, steel rings, heavy duty hooks, screws, sandpaper, outdoor paints, brushes, a saw, a thick wood board and a drill. To make the swing remove runners from the chair, and cut 4 long enough pieces of wood to protrude outside the armrest. Screw them to the bottom of the chair. Next, paint the whole swing into your favorite color. Using ropes and other prepared things hang the swing to a suitable tree branch that you’ve tested. After that try out the swing yourself and show it to your kids. They definitely will be happy for a long time.